Respected anthologist Leonard S. Marcus turns his literary microscope to the world of comics, which has lately morphed and matured at a furious pace. Powerful influences from manga to the movies to underground comix have influenced the thirteen artists and writers interviewed in these pages to create their own word-and-picture narratives. Here are their moving, funny, inspirational stories: true tales from the crucible of creative struggles that led each to become a master of one of today’s most vibrant art forms. The book also contains an original graphic short on the common theme of “the city" from each of the artists, a mini-comic set in a cityscape of their choosing—present-day, historical, or imaginary. Leonard S. Marcus is one of the world’s leading writers about children’s books and the people who create them. He is the award-winning author and editor of The Wand in the Word: Conversations with Writers of Fantasy; Funny Business: Conversations with Writers of Comedy; Show Me a Story! Why Picture Books Matter; Dear Genius: The Letters of Ursula Nordstrom, as well as many other books. His essays, interviews, and reviews appear in the New York Times Book Review and the Horn Book magazine. Leonard S. Marcus lives in Brooklyn. This is an engaging volume for the format’s fans to learn more about the creators behind popular works and might serve as a good bridge from graphic novels into more prose-based selections. A solid choice to supplement a robust graphic novel collection. Hard-core fans will be pleased. Most valuable for young readers may be the discussions of the cartoonists’ work routines, providing the indispensable insight that this is not just an art but a job and emphasizing the level of professional discipline it requires. In addition to the interviews, each cartoonist provides an original short comic, deepening the significance of their words and illustrating how comics occupy a seemingly impossible position, simultaneously intensely personal and resonantly universal. Though this will likely be most valued by kid fans of the assorted artists, this could easily serve as a source for a variety of programming both in the classroom and the library. Marcus’s chosen comics creators together represent a nice range of styles, topics, nationalities, backgrounds, and intended audiences...The profiles are concise and informative; taken together as a whole, the book represents a snapshot of the genre as it continues on its upward trajectory (what with Newbery Honors going to graphic novels in consecutive years). Each substantial, in-depth artist's interview is introduced by an insightful, expertly crafted biography, and accompanied by a short comic created by the artist just for this book...It's hard to imagine anyone—especially an aspiring artist—who wouldn't be fascinated and inspired by the creative paths of this talented group of graphic novelists and the thoughtful, clear-eyed context that Marcus gives their stories. 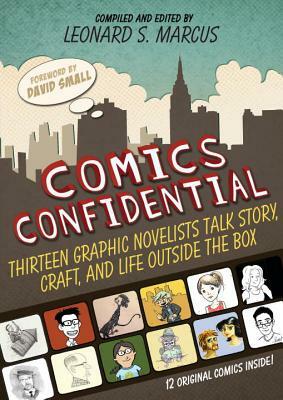 For comics fans who are a bit older , this collection has insights from some of the best, most thought-provoking graphic novelists for young people.